Smart ideas need equally smart spaces to hatch. 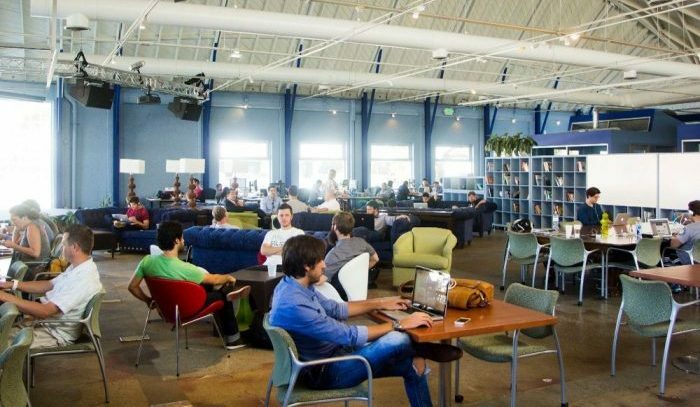 So, welcome aboard, as we have listed the most impressive coworking space Santa Monica. The city of Santa Monica, also known as Silicon Beach, itself is a stylish and sweet little alter-ego of LA. But is nevertheless, a fast emerging hub for entrepreneurs looking for shared spaces that deliver more and cost less. Besides, the multiple attractions in this coastal city, attract a lot of tourists and business persons. And why not? Beautiful beaches, pubs, cafes, thrift shops, etc are all little perks, much deserving after a day’s hard work. Finding the best coworking space Santa Monica, a gorgeous beachfront city is like a dream come true. This bay area city combines the calm of the ocean with the glory of the skies. And thus working from its precincts improves one’s motivation, creativity, and freshness of the mind. 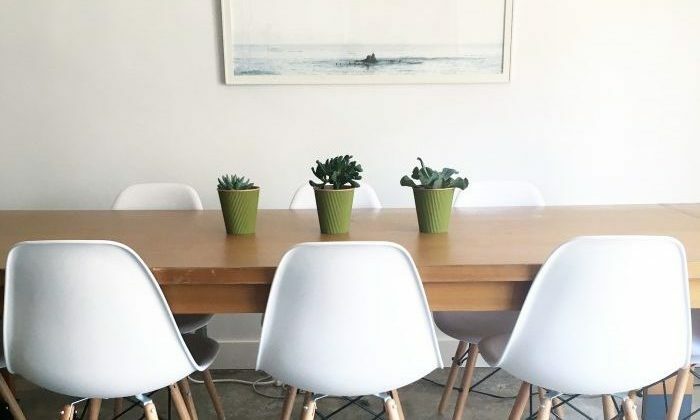 Though the ideal benefits of working from Santa Monica can be best captured when working from an equally elegant workspace. 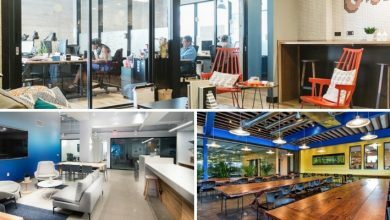 For this, we have shortlisted Santa Monica’s best spaces for coworking. So all you have to do is read through and pick the best fit from the following. Cross Campus is not only one of the best coworking spaces in Santa Monica but in Los Angeles as well. With Microsoft as one of the tenants, the authority of this space for Santa Monica’s entrepreneurs is easy to estimate. Cross Campus, in fact, has seven locations spread across the states of California and Arizona. Besides, its location in the heart of Silicon Beach is already a well-known tech hub. 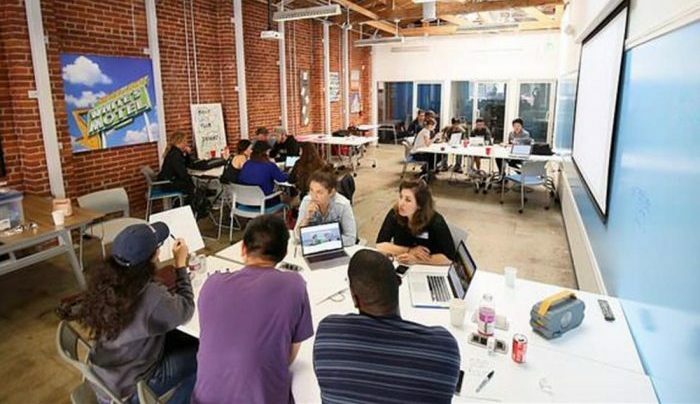 Thus you will find many innovative and creative minds thronging this space in LA county. Perks: Santa Monica’s Cross Campus offers coworking spaces, meeting rooms and event spaces. But the real perk is their bar area and the presentation platform. Moreover, you can try your hands on premium refreshments, including beer from Craft, Kombucha, or a nitro cold brew coffee. And as to their hireable rooms, you can get one with seats for two, or one for a large. Prices: A casual membership comes at $50 per month, while the prices of flexible hot-desking starts from $325 per month. Whereas for a permanent desk, the plan starts from $600 per month. While rents for a private office space vary by and large due to various factors including location, size, amenities etc. Though $930 per month is the starting price for office spaces here. Location: 929 Colorado Ave, is the home of Cross Campus in Santa Monica. This Westside location has many fine bars and cafes in the neighborhood. While accessing public transit is a cake walk. Contact: Ring at 310 421 4314 or send a message to info@crosscamp.us for any queries on this location. 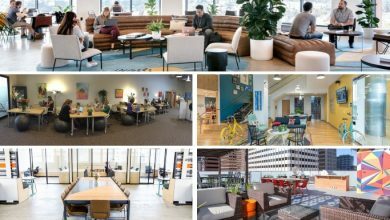 Coworking Space Santa Monica – Village Workspaces is like a cozy village with a community of thinkers and change makers. But don’t go with the name, it is actually a place that couples work with luxury. The walls, plants, desks, chairs and couches, all exude richness at its best. Which, also make it comfortable to work in. 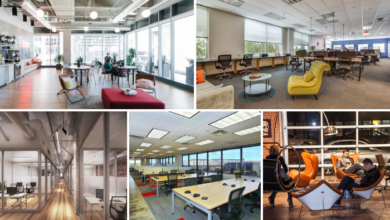 They have coworking, semi-private and private spaces for you to choose from. In addition to virtual office service, conference rooms, and event spaces. Besides, this beautiful coworking space is also located a block away from an equally beautiful beach. Also, the spaces are accessible round the clock, so you can come at your time. Perks: The major perks include complimentary coffees, member breakfasts, which are an excellent way to meet and make connections. And if you need a stroll under nature’s lap, cross a block down, for a walk on the beach. 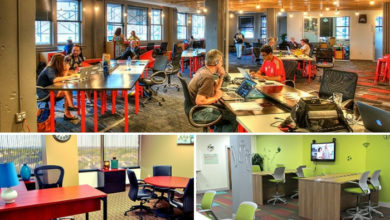 Prices: Coworking here comes at the price of $400 per month. While the private office spaces start from $500 for one member office and so on. 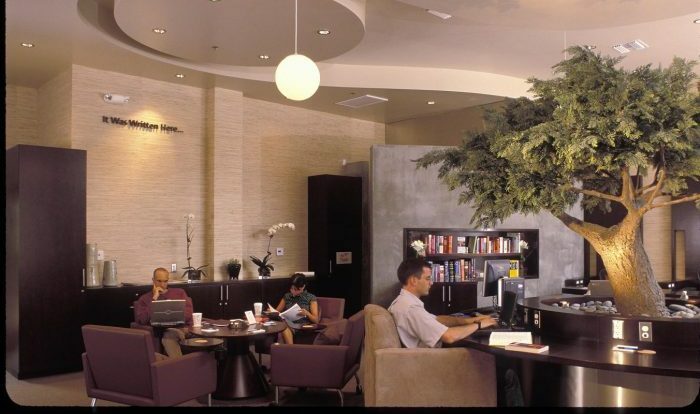 Location: Village Workspaces is nestled in 212 Marine Street, Suite 100 in Santa Monica. The buses are accessible at a short stroll. While many cafes and restaurants options are available in the vicinity. Contact: For any queries, you may call Village Workspaces at 310 450 7070. Or you may also send an email to santamonica@villageworkspaces.com. 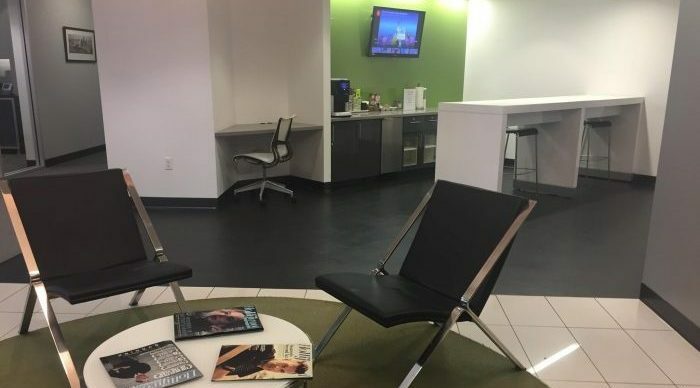 Regus, the global coworking giant is almost omnipresent in most cities in the world including some cool coworking spaces Santa Monica. And naturally, it brings along the global experiences and community access under every roof it holds. They have a range of options for you to choose from. As they have coworking desks where you may have a seat for yourself, or perhaps a startup office. On the other hand, you will also find fully customizable private office spaces, besides meeting rooms and business lounges. And, sorry I forgot to mention, they have virtual office services as well. Perks: All Regus locations are full of perks to the brim. At one, you will find an outdoor terrace, while the other might be close to a gym. Similar perks include onsite cafes, parking facility, business lounges, disabled access, etc. Prices: As to how many bucks you shall have to shell out, it’s $112 for five days a month. Though a full months access to hot desks comes at the monthly price of $299. While for the cost of $99 per month, you get unlimited access to their business lounges. The office spaces, on the other hand, cost around $539 per month. Please note that actual prices may vary from location to location. Contact: You may contact Regus at +1 3107 722 248 for any additional details. Blankspaces is a gorgeous coworking place where flexibility and comfort are given special attention. The high ceilings and skylights fill this downtown Santa Monicacoworking space with ample sunshine. The exposed brick walls, on the other hand, add crispness to it. 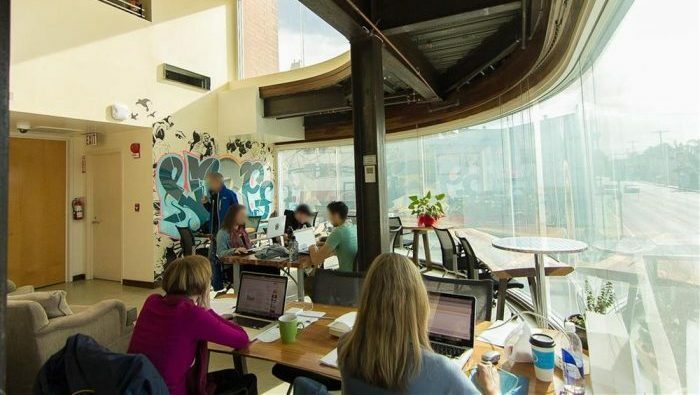 They offer coworking cafe-like space, besides dedicated workstations, and an array of office spaces. Apart from virtual office packages. Services also include mailing address, VOIP services, internet access etc. And if you are new to coworking, try their space for a couple days via their trial package. Perks: Mention worthy perks at Blankspaces coworking Santa Monica are, private phone booths, conference rooms, and their beautiful kitchen space. In addition to a large space that you can hire for your business events. A spacious parking lot is just across the street. While the upscale shopping precincts of downtown Santa Monica, the Promenade is only a block away. And at the same distance is a lovely beach. Prices: Prices start at 5-hour access to hot desks for $15 and $25 for dedicated desks for the same hours. Though monthly access to the open lounge coworking area comes for the price of $275. While it will cost you $650 for a large private desk, per month. Office spaces, however, have different prices for different sizes. For instance, a private office for one has $1100 as the price. Naturally, the price escalates for bigger office spaces. Location: This awesome space is located at 1450, 2nd Street in Santa Monica, California. Contact: To talk with a Blankspace executive, call at 310 526 2255. Or send an email to bsm@blankspaces.com. 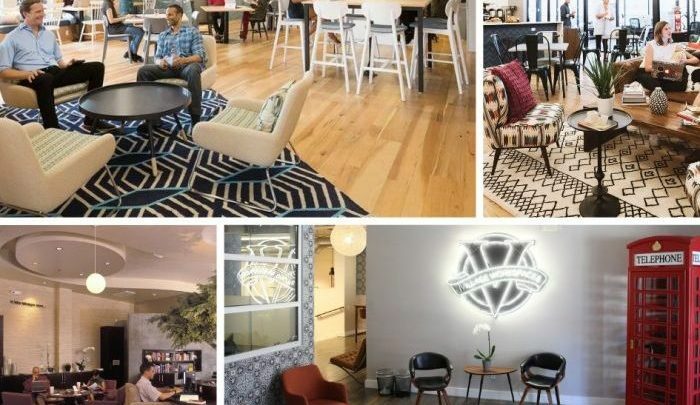 Does WeWork need any introduction? This global coworking network comes with many perks and prizes. These are a great escape from the seclusion of a home office. As they enhance productivity and efficiency like never before. Besides many great opportunities to grow, network and collaborate will become handy here. At their spaces, they offer hot and permanent desks, apart from private office services. 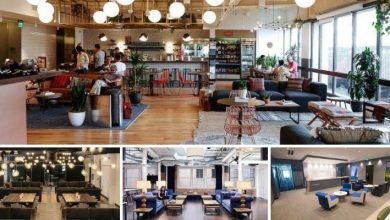 Perks: Coming to the perks at WeWork coworking space Santa Monica, they have a great deal on offer. Super fast internet, support staff, and print stations are what you will find common at all coworking spaces. But apart from these, you can quench your thirst and fatigue on delicious fruit water or freshly roasted coffee. Additionally, you can also access phone booths, lounge areas, and bike racks. They even have a wellness room, wherein you can relax, meditate or just have some me-time. Prices: Different locations have different prices. Prices for hot desks start from $525 per month. 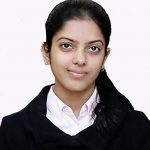 Price for dedicated desks though begins from $600 per month. Lantana, 3000 Olympic Boulevard, Santa Monica – Just announced! Contact: To talk with a WeWork guy, call at their toll-free number, 1800 123 365 365. 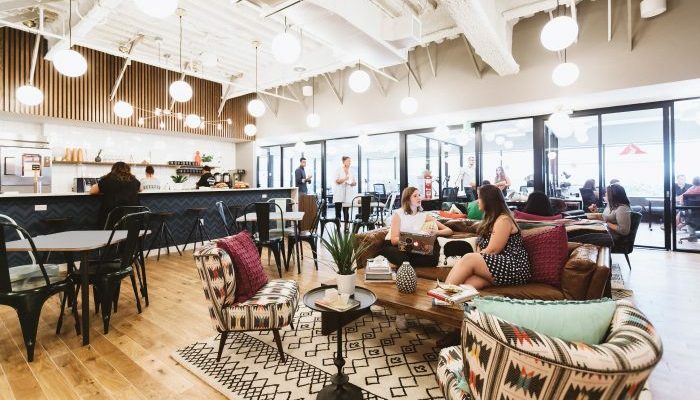 This impressive Santa Monica coworking space is an eye pleaser. Its creative interiors and smart seating add to the work devotedness. Plus, they will also keep fatigue and stress at bay. And with the unique designer furniture and facilities on offer will amplify your entrepreneurial skills. Further, it is situated among the best of tech businesses and of course the buzzing Promenade on the third street. Perks: Close proximity to a beach and a happening retail precinct is an unmatchable perk. 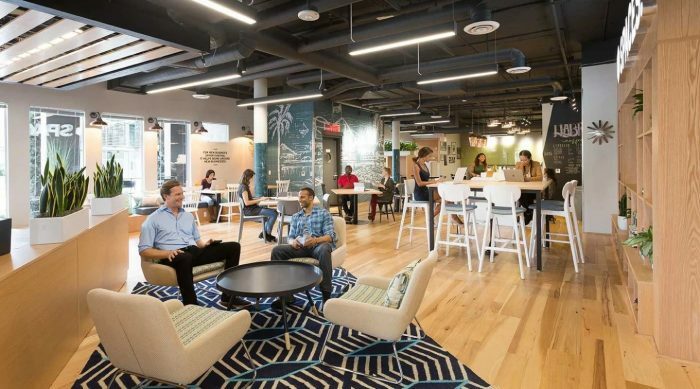 Besides, they have a whopping 200 plus coworking desks spread on a twenty-five thousand plus office space. And they have a balcony too! 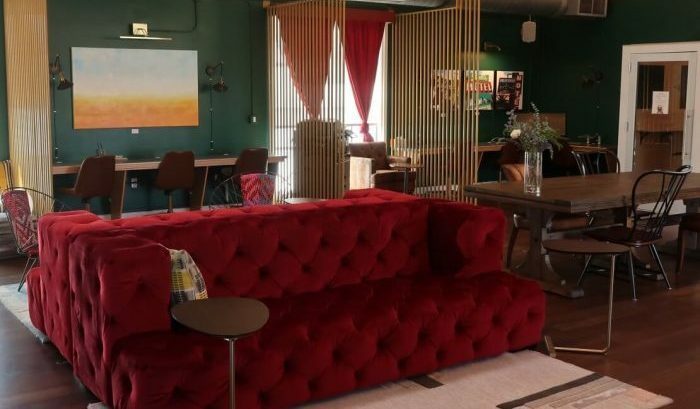 Prices: The comfy coworking area is obtainable for $500 per month. The price is however same for dedicated desks so you have an equal opportunity to choose between the two. Also, round the clock, accessible private office space has a price of $820 per month. Location: 730 Arizona Avenue in Santa Monica is the address of Spaces coworking spaces. Cycle a little towards the beach and it might make your day! Contact: To communicate with a Spaces exec, ring the number, (424) 330-1800. Or send an email to reception.santamonica@spacesworks.com. The Satellite is another great coworking space Santa Monica. Open coworking area or private spaces like an office, meeting room etc are all available here. And even virtual office services. Its location is set in the downtown, where many cafes, bars, and restaurants are at a stone’s throw. Also, whenever exhaustion bothers you, just go for a quick stroll to the beach or an eatery and voila! The fresh you will be ready to get back on work again. Perks: The best perk, this space is pet-friendly. Additionally, there is a receptionist, kitchen, mail handling, service, etc, besides unlimited tea and coffee. 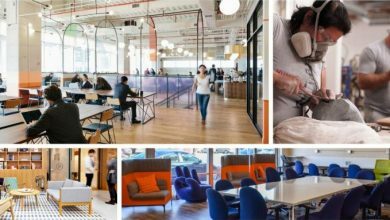 Prices: Paying within the range of $270 and $480 per month, will get you access to the coworking desks. While private spaces are also available, between $285 and $850 per month. Location: The location of the Satellite Santa Monica is the Annex at 3110 Main Street in Santa Monica. Contact: They are contactable on the number 310 452 4200. And also on their mail id, santamonica@thesatelliteinc.com. Writers, journos, bloggers and everyone else who needs a calm and quiet workplace, this space is for you. 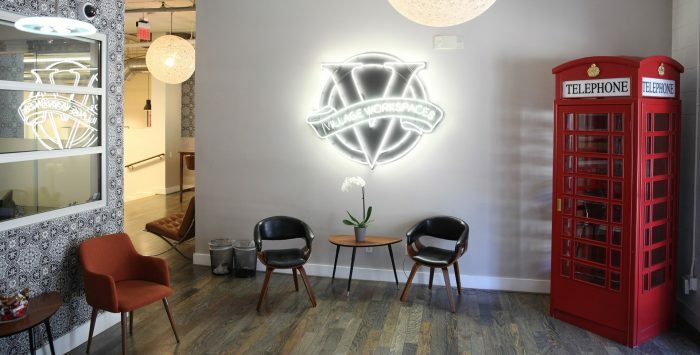 One among the best coworking space Santa Monica, the peace you can enjoy here is unbeatable. This space will help you concentrate on your piece of work, along with many others who work around with words. So, enjoy the peace of mind and let your creativity reign high. Perks: Tranquility is the biggest perk here. But nevertheless, a week’s free trial access is also a decent perk. Besides, to keep noises at the minimum, they neither have conference spaces nor buzzing telephones around. Prices: They have a very simple pricing model. Apart from free one week trial, you may get a day’s access for $39. After that, a monthly fee will be payable in addition to a one time joining fee of $69. Location: To be in this quiet space you have to visit 1347 19th Street in Santa Monica. Contact: Before visiting do schedule a visit by ringing on 310 917 4455. Or by posting an email to info@theOfficeOnline.com. OnePiece Work is the best space for innovators and entrepreneurs. For this space gives you access to workspaces, technology, and a great community. In addition to all the business coaching, capital support and networking opportunities that startups live and grow on. Moreover, close proximity to Beverly Hills, Hollywood and of course the Silicon Beach is an add on advantage. Making it another amazing coworking space Santa Monica. Perks: As supplementary perks, you will get unlimited tea, coffee, and snacks, high-speed, internet and 24/7 access to the workspaces. Plus, they also have mail handling, private booths for calling and reception service. Prices: A flexible hot desk in a common area is valued at $350 per month. While a permanent desk is just a $100 more, i.e. $450 per month. Whereas a ready to move in a private office is available for $1500 per month. Location: 631 Wilshire Boulevard is the home to OnePiece facility in Santa Monica. This downtown location is also close to a picturesque beach. Contact Call at 626 429 6496, or mail at torri@1piecework.com for any information. A home by the side of the sea is the desire of many. But what if we give you a workspace by the seaside. And Beach House Cowork is situated at the perfect distance of a few steps from the westside Silicon Beach. The interiors too are designed well to enthuse creativity and stress-free environment. Further, there are plenty of means around this coworking space Santa Monica to relax and refresh your mind, body, and soul. Perks: They extend free tea, coffee, and snacks to all members. In addition to mail handling and concierge services, conference spaces, and a kitchenette. The three lounge areas and patio and bar space are definitely worth a mention here. Prices: They are very flexible on pricing as their membership ranges from an hour to days, and months. Cowork here with a day pass for $25 or a week pass for $125. While monthly memberships include $350 for hot desks and $450 for dedicated desks. Location: 2219 Main Street in Santa Monica is the address to be at. Contact: To talk with a Beach House exec call at 323 320 5067. For any information, you may also mail to info@beachhousecowork.com. Freelancer, entrepreneur, or a visitor along this coastline, this list will make it easy for you to choose the best. Plus its time you get more productive and skip the lethargy that comes with work at home. Get yourself one space and multiple connections and see the boom in your productivity and frame of mind. Moreover, these top coworking spaces Santa Monica are just miles away from the sea. So work to your heart’s content and then refresh yourself to the luxury of the sound of the ocean. Work is fun and stress-free when working in the locale of a beautiful beach resort town. But then what’s the best way to work and not get any sand into your laptop? Simple! Visit and be a part of any of these coworking space Santa Monica. Though a freelancer or an entrepreneur, coworking can be a game changer for the speed with which you attain your goals. And may the tide of prosperity rise in your favor. Good Luck!